127 mm/38 Mk21 mod. 05 х 1 pcs. 533 mm Mk142 х 4 pcs. 127 mm/38 Mk21 mod. 12 х 1 pcs. 127 mm/38 Mk21 mod. 03 х 1 pcs. 127 mm/38 Mk21 mod. 02 х 1 pcs. 127 mm/38 Mk21 mod. 14 х 1 pcs. 20 mm Oerlikon Mk45 х 1 pcs. The first U.S. destroyer of the new generation. She was armed with dual-purpose artillery, which significantly enhanced her AA defenses. The torpedo tubes were placed along the ship’s centerline, and thus they could be used more efficiently. The destroyers of this class were modernized to receive automatic AA guns. Farragut continues the evolution of American destroyer design where Nicholas left off, retaining the same main battery guns — adding one more — while moving to a centerline-mounted torpedo configuration. Players who enjoyed Nicholas will find more of the same with Farragut. Her speed and handling characteristics are nearly identical, and she starts off with the exact same 5.5 km range torpedoes (the Mark 11) of her predecessor. The eventual torpedo upgrade module is worthwhile, giving her almost a full kilometer more of torpedo range and, more critically, faster fish. The move to centerline mounts for her torpedo launchers takes some getting used to; she can put eight torpedoes into the water on either side, but captains are likely to miss the flexibility offered by preceding ships of having launchers on both sides of the ship. Irritatingly, Farragut has a smaller health pool than Nicholas; Level 3 commander skill Survivability Expert is almost necessary in order to get the most out of her. Like her immediate predecessor, she can exchange Engine Boost ( ) for Defensive AA Fire ( ), but she must equip Hull (C) — and give up one of her main battery guns — to do so. Airplanes remain one of Farragut’s biggest weaknesses, and her anti-aircraft suite remains largely powerless to deter them. Overall, Farragut is a solid destroyer that loves maps with lots of islands she can hide in. American destroyer captains wishing for the capability to fire torpedoes from beyond their detection range must remain patient and wait for Mahan. Main battery rate of fire is excellent. Solid top speed of 36.7 knots; she can break 40 knots with the Engine Boost ( ) consumable. Upgraded torpedoes have a 0.9 km higher range than stock version, and travel noticeably faster. Very weak armor; takes damage just as quickly as Nicholas. AA guns are mainly for show and will rarely shoot anything down; even the hull upgrades don't do much to help. Hull (B) only adds 600 more hit points, and she has fewer hit points than Nicholas. Shell arcs make long-range targeting difficult. Hull: Upgrade to Hull (B) for more health and improved rudder shift time. Unlocking Hull (C) removes one main battery gun (and comes with a corresponding reduction in long-range anti-aircraft firepower), increases her short-range AA suite, and allows Farragut to equip Defensive AA Fire ( ). Research of Hull (C) unlocks progression to Mahan. Torpedoes: The Mk12 torpedoes travel faster and farther than the stock Mk11's for no change in reload speed; Hull (B) must be equipped before they can be installed. Gun Fire Control System: Upgrade to Mk6 mod. 2 for an extra 10% range on the main battery. As a gunboat destroyer, Farragut is best served by maximizing her health pool; this makes Hull (B) the best place to spend early experience gains. Her stock gun range is quite good, so snag the Torpedo module upgrade next, followed by the Fire Control System module to buff her main battery range. Hull (C) is an optional upgrade for captains who are interested in access to the Defensive AA Fire ( ) consumable. It is probably best grabbed after unlocking Mahan or skipped completely. There aren't a lot of "out of the box" options in terms of upgrades for Farragut captains. Main Armament Modification 1 is the top pick in Slot 1, while Aiming Systems Modification 1 is recommended for Slot 2. AA Guns Modification 1 ( ) might be a decent option for captains who equip Hull (C) and swap Engine Boost ( ) for Defensive AA Fire ( ). Propulsion Modification 1 in Slot 4 and Propulsion Modification 2 in Slot 5 are both highly recommended in the interests of sustaining Farragut’s mobility while under fire from enemy ships. Preventative Maintenance at Level 1, Last Stand at Level 2, and Concealment Expert at Level 4 are easy recommendations for Farragut commanders. Level 3 offers a number of good options. Survivability Expert is a safe pick, buffing Farragut’s health pool by 20%. Demolition Expert or Basic Firing Training are recommended for captains looking to get more damage out of their main battery. Superintendent is a strong choice if premium consumables are not equipped. Alternate Level 4 skill recommendations include: Manual Fire Control for AA Armament for captains using Hull (C), though the overall DPS gain is incredibly small for investing four skill points; Advanced Firing Training to buff the range of Farragut’s main battery as well as her anti-aircraft guns; Radio Position Finding, to aid in hunting down enemy destroyers; and Inertia Fuse for HE Shells, which will improve Farragut’s main battery damage against enemy capital ships. Given how easily modules are disabled on a destroyer under fire, investing credits (or doubloons) in Damage Control Party II ( ) is recommended. The free versions of Engine Boost ( ) or Defensive AA Fire ( ) should be sufficient for random battles. 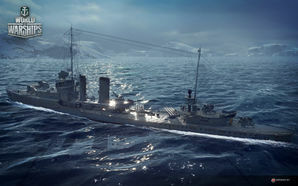 Players who wish to spend doubloons can equip Farragut with Type 16 camouflage that lowers her detection radius, reduces the accuracy of incoming shells, reduces her repair costs, and increases the amount of experience she earns. Equipping Juliet Whiskey Unaone ( ) is recommended; Farragut captains who work into torpedo range of enemy ships need to get maximum results. Juliet Charlie ( ) is also a well-advised choice for any destroyer. Victor Lima ( ) and India X-Ray ( ) signals are similarly worthy of consideration to increase the fire chance of her main battery shells. Captains who opt to equip Hull (C) may wish to fly November Echo Setteseven ( ) and Sierra Mike ( ) as well. The Farragut class was a series of eight destroyers built for the US Navy between 1932 and 1935. They were the first destroyers built for the US Navy since the Clemson class 12 years prior. They were limited to under 1,500 tons displacement by London Naval Treaty of 1930. Three of the class were lost during Typhoon Cobra in December 1944; no examples survive today. Launching of USS Farragut (DD-348), 15 March 1934. Farragut anchored at harbor, circa 1935. Farragut underway off San Diego, California, 14 September 1936. Farragut leading a column of Destroyer Squadron Twenty (DESRON20) ships, during maneuvers staged for Movietone News, off San Diego, California, 14 September 1936. The next ship astern is USS Aylwin (DD-355). Farragut during maneuvers staged for Movietone News, off San Diego, California, 14 September 1936. She is being overflown by five patrol planes. At left is a PBY-1 of Patrol Squadron Eleven-F (VP-11F). The other four are P2Ys of Patrol Squadron Seven-F (VP-7F). Farragut underway in December 1943. Farragut off the Puget Sound Navy Yard, Washington, 29 September 1944. Her camouflage scheme is Measure 31, Design 7d. This page was last modified on 19 February 2019, at 04:00. This page has been accessed 59,601 times.